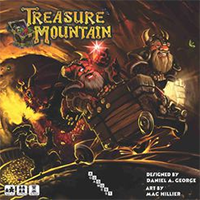 Your dwarf clan has been chosen by King Grimsteel to mine the vast riches buried within Treasure Mountain. You must dig deep, keep your axes close and beware of the pillaging dragons that plague the mountain in search of treasure. Dwarf clans earn victory points by mining gems, earning gold, building mines, and fighting dragons. The clan with the most victory points at the end of the game gains the favor of King Grimsteel and wins the game. Treasure Mountain is medium-light strategic worker placement game with a unique "bumping" mechanic that also creatively integrates some tile laying. With multiple paths to victory, which will you choose?